C-geNOp is a cyan fluorescent genetically encoded sensor capable for specific detection of intracellular nitric oxide (NO•) dynamics. It has been developed on the basis of cyan fluorescent protein (CFP) that is conjugated with a NO•-binding domain of the Escherichia coli protein NorR. Upon NO• binding to C-geNOp the cyan fluorescence intensity is immediately quenched. The NO•-dependent quenching effect correlates with the cellular NO• concentration. Fluorescence of C-geNOp rapidly and fully recovers in the absence of NO•. Hence, C-geNOp provides a highly specific real-time read-out of cytosolic NO• dynamics. The excitation and emission maxima of C-geNOp are at 430 nm and 480 nm, respectively. Standard optical filters optimized for imaging of CFP should be used. 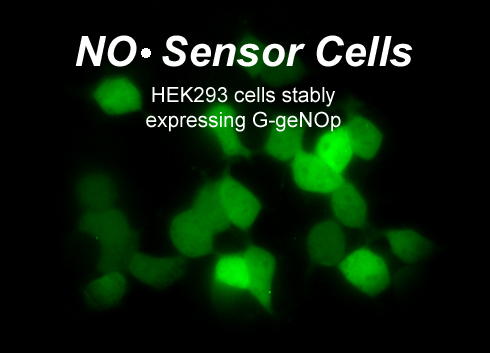 C-geNOp is a genetically encoded cyan fluorescent biosensor that can be used to monitor NO• dynamics within intact living cells. 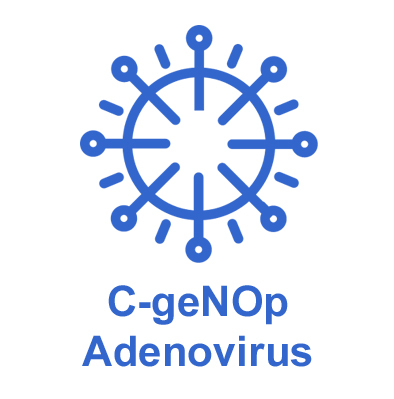 In order to express C-geNOp in cells of interest 20 µg purified, endotoxin-free plasmid DNA coding for C-geNOp is provided. 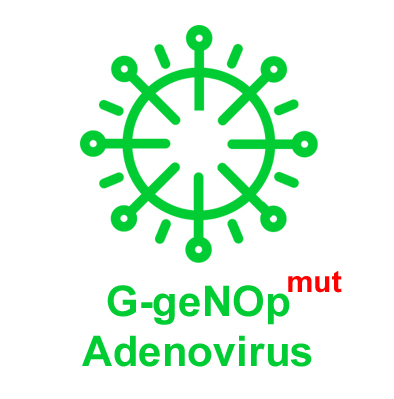 The plasmid coding for C-geNOp represents a mammalian expression vector with a strong viral promotor. We neither recommend using the plasmid as a source for the C-geNOp sequence nor multiplying it. 1 – 1.5 µg DNA should be used for cell transfection in a single well of a standard 6-well dish following standard transfection procedures. Usually cells express high amounts of C-geNOp 24 – 48 hours after cell transfection. 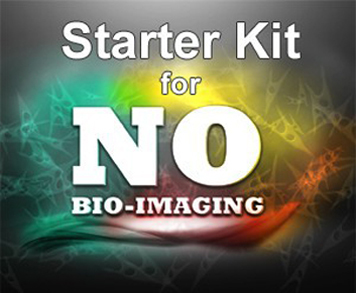 In order to supply the NO•-binding domain with sufficient iron(II) cells need to be treated with the non-toxic iron(II) loading buffer for at least 10 minutes. To test the responsiveness of C-geNOp in cells, addition of potent NO-donors is recommended. High amounts of NO•-donors such as NOC-7 (10-100µM) should quench C-geNOp fluorescence by at least 10%. C-geNOp has been successfully used to visualize cellular NO• dynamics in different cell types in response to various NO•-donors and is capable to detect endogenous Ca2+-triggered NO• production in endothelial and neuronal cells. To assess the NO•-selectivity of the C-geNOps signals a mutated probe, C-geNOpmut, is also available. Perform your protocols of interest. Reduction of C-geNOp fluorescence specifically occurs upon a cytosolic NO• elevation, while C-geNOps fluorescence increases specifically upon a cytosolic NO• decrease.